Have you ever noticed how people change? Some change for the better as they grow, mature, and learn from practically everything that life throws at them. Others withdraw and harden their hearts in opposition to the pain and fear within themselves and the world around them.The truth is we probably all change in different ways at different times…sometimes for the better and sometimes not. 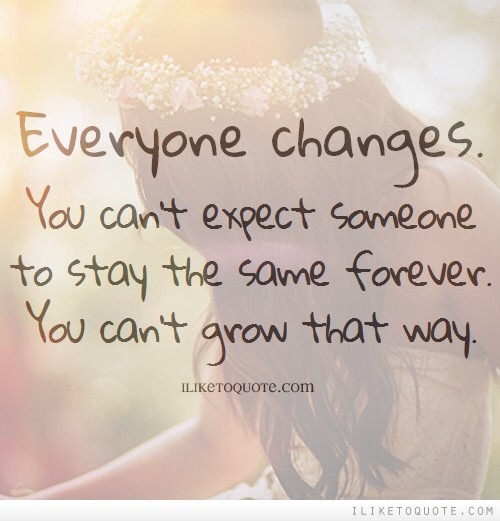 And, in my experience, other people rarely notice those changes right away. Our view of one another is like a picture, a snapshot of a fixed moment in time. Like a picture, our view of one another usually does not change much, unless something drastic occurs. In contrast, the actual thing within the picture is often living and breathing and changing. Take the sky, for example. The sky is hardly ever the same moment to moment….clouds move, birds pass by, the sun journeys from east to west. A picture of that sky is set in stone. But the actual sky itself is always changing. Though we tend to see one another as pictures, people are much more like the sky itself…constantly moving and changing. And yet there are moments in life when something amazing does happen and we see someone in a different way. We notice changes that they have made. There is something new about them. We realize that they are now someone we did not see before. It is in such moments that we treat one another as truly human because we see the living person not just the picture of them that resides in our minds eye. This week we encounter the biblical story known as the Transfiguration (Matthew 17:1-9). It is, at its core, a story where a few of the disciples walk with Jesus up a mountain and begin to see Jesus in a new way: “his face shone like the sun and his clothes became dazzling white.” The disciples leave this experience with a new perspective – new understanding of Jesus, of his connection to Moses and Elijah, and of the journey which was before him. Because of this new perspective, their relationship to Jesus is strengthened and changed for the better. I wonder if there is a relationship in your life that could use some strengthening right now. Maybe a new perspective, some new understanding about that person is waiting for you if you will walk up the mountain to see who he or she truly is – how he has changed or what journey she is traveling. Perhaps your picture of this person would become living and you would find yourself changed for the better, too.